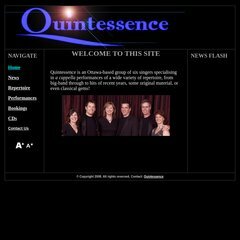 Topics: Repertoire, Performances, Bookings, Quintessence Joins, & Quintessence. It has 2 DNS records, ns2.reg.ca, & ns1.reg.ca. It is hosted by Dotalliance (British Columbia, Langley,) using Apache web server. Its IP Number is 66.196.36.198. PING (66.196.36.198) 56(84) bytes of data.